Spokes’s vision is for Edinburgh to emulate cities like Copenhagen, Seville and Barcelona, which have reclaimed the streets for people on foot or bike, for buggies and wheelchairs, for locals and tourists – improving quality of life and generating new economic opportunities. This means removing motor traffic, so that Princes Street becomes a place where people on foot and bike can coexist safely and happily with trams and perhaps a low-speed electric shuttle-bus. Our petition is on the council petitions website – click here to find it and sign up now!! If the petition gets at least 500 signatures from Edinburgh residents*, it will be debated by the Council petitions committee, who can then recommend that the Council should develop detailed proposals and consult the public. *If you live outside Edinburgh you can’t sign, but if you are a regular or occasional visitor and are unhappy with Princes Street, please email leaderATedinburgh.gov.uk [and copy to spokesATspokes.org.uk]. The council needs to know what visitors think!! Thank you. 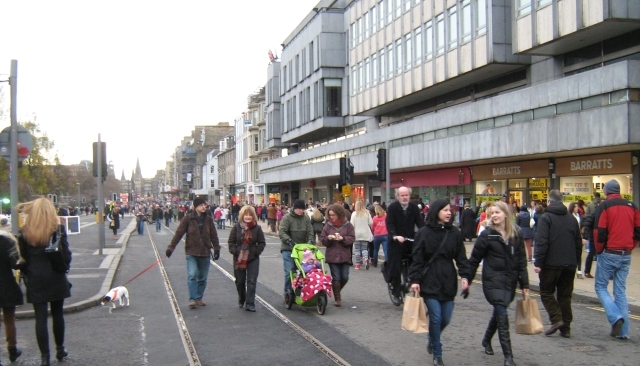 Spokes’ call is in line with the Council’s own 2010 report on Edinburgh city centre by renowned international Cities for People planning expert Jan Gehl, which recommended transforming Scotland’s premier street from being ‘traffic dominated’ into a pedestrian-friendly, cycle-friendly, and lively thoroughfare with cafes, greenery and seating. Sadly, the council has so far taken no significant action on its own report. Our petition is also supported by Sustrans Scotland, CTC Scotland, Storybikes, Edinburgh Festival of Cycling, Sustaining Dunbar, ..
Tramline crashes – sadly, Princes Street is experiencing a continuing tragedy of tramline bike crashes, with around 2 a month officially reported, often resulting in hospital casualty visits and ‘minor’ injuries with effects which can be disabling or painful for weeks or months. It is clearly only a matter of time until something even more serious happens. Many of the crashes are due to traffic pressures – either a cyclist travelling parallel to the lines but forced sideways, or a cyclist needing to cross the lines but unable due to traffic to position themselves safely enough. Word is spreading, and we are hearing of people who now avoid visiting the city centre by bike. For bike/tram background and advice, see our tram web page. 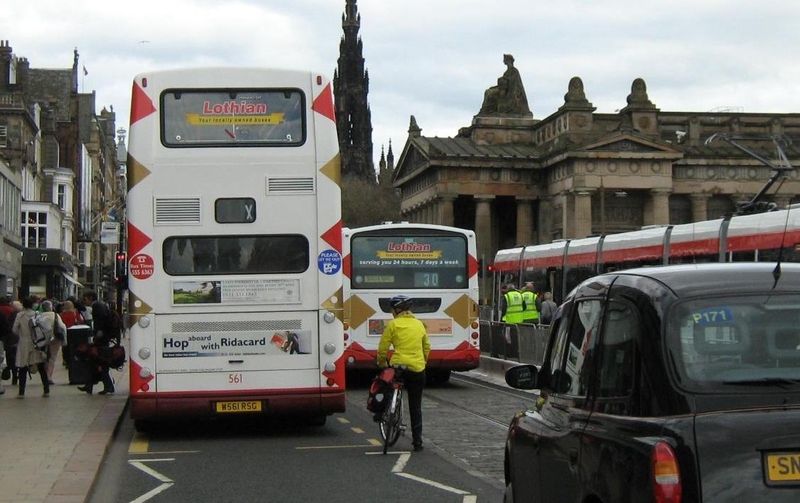 The wider City Centre – of course we fully appreciate that Princes Street cannot be seen in isolation, and nor can bus/taxi patterns be changed without careful thought. Our petition highlights Princes Street because it is Scotland’s top street, because it is the ideal east-west cycling connection (not entailing the many left/right maneouvres to use George Street) and because its current problems and missed opportunities are so blatent. If our petition leads to action, it will certainly be action involving more than Princes Street alone. Princes Street paradise – yes, the photos above are real, not photoshopped! They were taken during a brief Christmas break in the tramline works and show the potential even before cafes, seating, greenery, level paving etc. 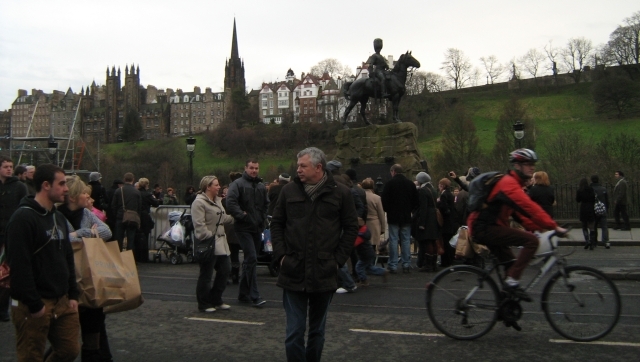 Back in 2009 the then Deputy Council Leader Steve Cardownie said our idea for trams, pedestrians and cyclists only in Princes Street would “allow us to compete with the likes of Paris, Barcelona and Prague. It’s a fantastic street – it would be absolutely splendid.” [Evening News 14.4.09, 23.4.09] [Spokes 104 – pdf 2MB]. Princes Street Traders‘ Rob Winter envisaged “a positive effect on the whole environment” and Visit Scotland says it would “help promote Edinburgh around the world” [Evening News 23.4.09]. Sadly, the tram contractual shennanigans then intervened, and councillors could think no further for the next 2-3 years! Now, however, with work proceeding rapidly, a few councillors are starting to realise that Princes Street, in its present condition, is letting the city down badly. Our petition is intended to speed up council attention to Princes Street and the city centre, and to keep cycling as a major component, in line with the council’s bold cycling targets and with the Gehl recommendations. If you belong to a relevant organisation, ask if they wish to be listed above as supporting the petition. We will include a link to their website if so.